Tibet's harsh environment can be the biggest challenge for officials and professionals from the inland areas taking part in the national Aid-Tibet program. 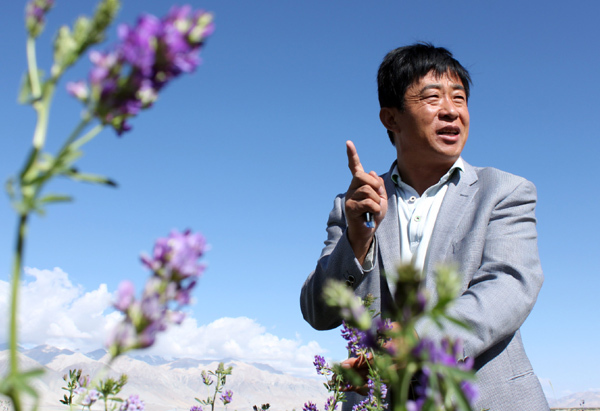 "I grew up in a poor countryside in Shaanxi and thought the situation in my hometown was tough, but Tibet is tougher," said Han Junwen, a 47-year-old agriculture specialist working in Ngari. When Han first arrived in the prefecture in the west of Tibet in 2005, he took a shower only once a month because of lack of water. "I had to travel one hour from my village to the county to take a shower," he said. "But after a decade of development, the living standard in Tibet has improved. That's why I chose to stay, unlike other people in the program who returned home after three years." Even with better infrastructure and facilities, the extreme weather and lack of oxygen on the Tibetan plateau, which has an average altitude of more than 4,000 meters, can still be very damaging to health. Cheng Wenjie, head of Gar county in Ngari, said he needs at least five days to adapt to the altitude sickness every time he returns to the county from a vacation. "It gets very hard to breathe," the official from Shaanxi province said. "And I get this splitting headache." Cheng's predecessor, Zhang Yu, died in office in 2012 at the age of 46. "He worked so hard that he suffered a heart attack," Cheng said, "At such altitudes, the risk of having a heart attack is high." Gar is one of the driest areas in Tibet in summer and the fierce ultraviolet rays are strong enough to burn people's skin with brief exposure. In winter, snowstorms can lash the area and devastate crops and livestock. "Last year, the snow was up to our hips and we couldn't push the doors open if we didn't clear the snow immediately," Cheng said. "Most times it was just too cold to go out." The county administration started building its first fitness facility this year to keep people active in winter. "We want to protect people from the harsh environment," Cheng said. "We traveled more than 2,000 kilometers to work here. This is what we do to help."